All India Institute of Medical Sciences (AIIMS) invited applications for recruitment to 105 posts of Senior Residents (SR). The candidates eligible for the post can apply in the prescribed format and appear for Walk-In-Interviews post wise. The interview for the post of General Medicine will take place on 08 May 2017. For others please refer to the official notification below. Senior Resident (SR) : A post graduate Medical Degree/Diploma in respective discipline from a recognized University/Institute and DMC/DDC/MCI/ State Registration is mandatory before joining, if selected. For others please refer to the official notification below. The selections for these posts will be made through the performance in Walk-In-Interviews. The desirous candidate must be below 33 years of age. Age relaxations for candidates belonging to the reserved categories will be done as per government of India norms. The eligible and desirous candidates can appear for a Walk-in-Interview along with the relevant documents as per the dates of the respective posts given in the recruitment notification below. The interview for the post of Senior Resident (SR) General Medicine is 08 May 2017. The interviews will start from 10:00 AM. The venue of the interviews will be Committee Room, 1st Floor, Medical College Building, Gate No. 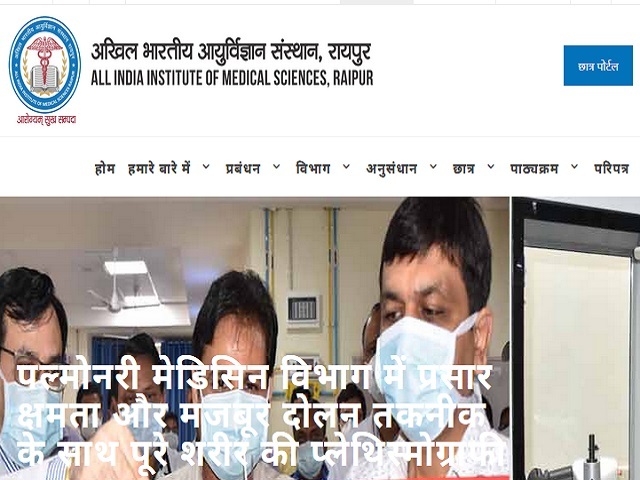 5, AIIMS, Tatibandh, G.E. Road, Raipur (C.G.) - 492099.